Make this dog rock painting idea in just minutes! 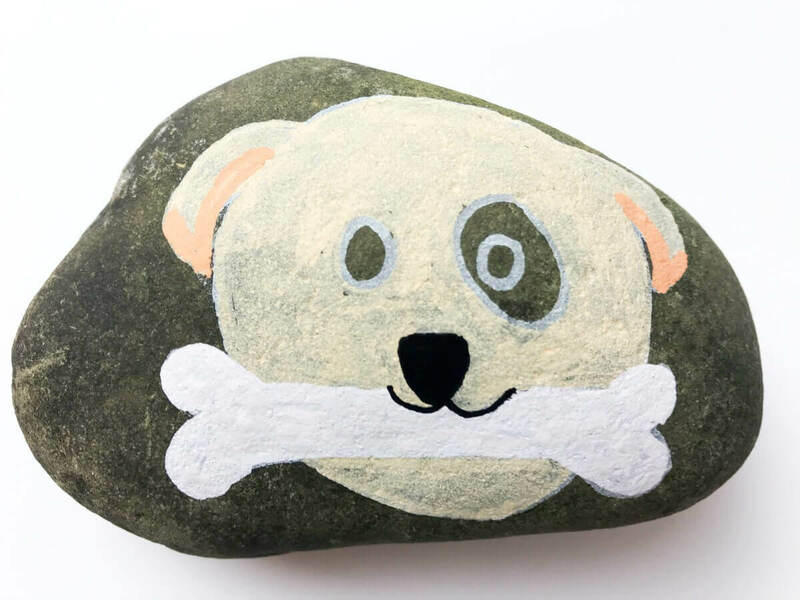 Follow along with a step-by-step tutorial and let us walk you through how to paint this adorable puppy on a rock. Here on Ruffles and Rain Boots, we love to share tutorials on how to actually DO the things you see on Pinterest. :) Be sure to visit our rock painting menu (above) to see all of the ideas we’ve shared so far. For other rock painting ideas, be sure to follow Ruffles and Rain Boots on Pinterest. We are absolutely addicted to rock painting and pinning amazing inspiration for rocks. Now it’s time to follow along with this easy step-by-step tutorial and draw and adorable puppy in no time. RELATED READING: Step-by-Step Unicorn Rock Painting Idea – Adorable! 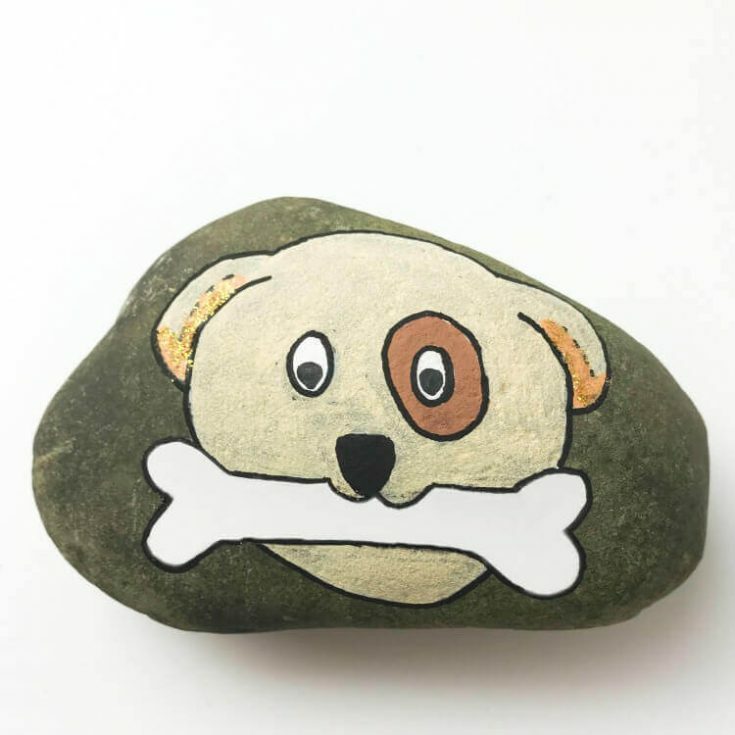 You don’t need much to get started with this fun rock painting idea for dogs. For a step-by-step written instruction with images, see below. Or, you can watch this video to draw and paint along right beside us. 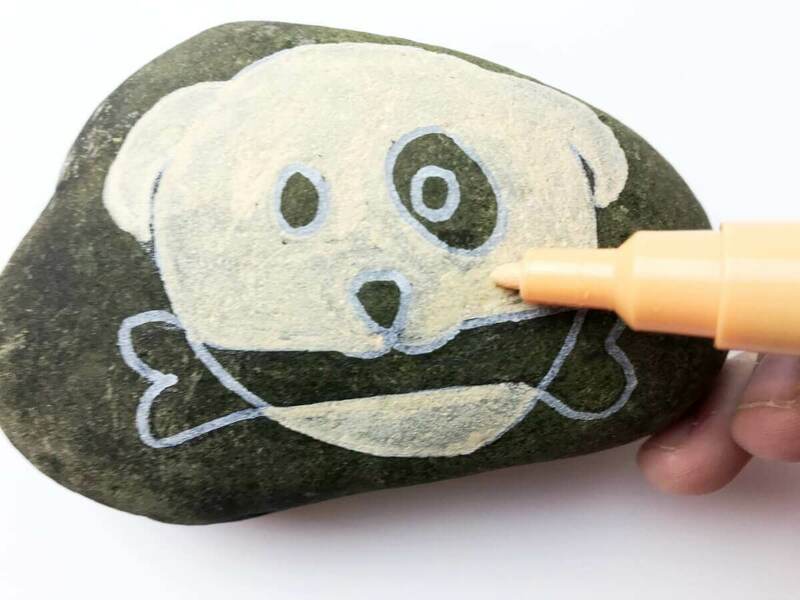 If you’d like to watch the video of how easy this cute dog rock painting idea comes together, scroll down. Now, let’s get started. 1. Create a large circle or oval for the dog’s head. 2. Add the outline of a bone, extending beyond the circle. 3. Add on a triangle nose just above the bone and ears. Add two small circles for the eyes and a patch, if desired. 4. Fill in the dog’s face with the desired color, adding in lips just under the nose and on top of the bone. Fill in the bone with white. 5. Add any color to the ears, color the small eye circles white, and fill in the patch with the desired color. 6. Fill in the eyes with black dots and the nose. Outline the entire dog rock painting. Optional: add glitter accents to the ears or bone. 7. Cover the paint-pen colored area with a light coat of ModPodge to prevent the paint pens from running. Once dry, add sealant. 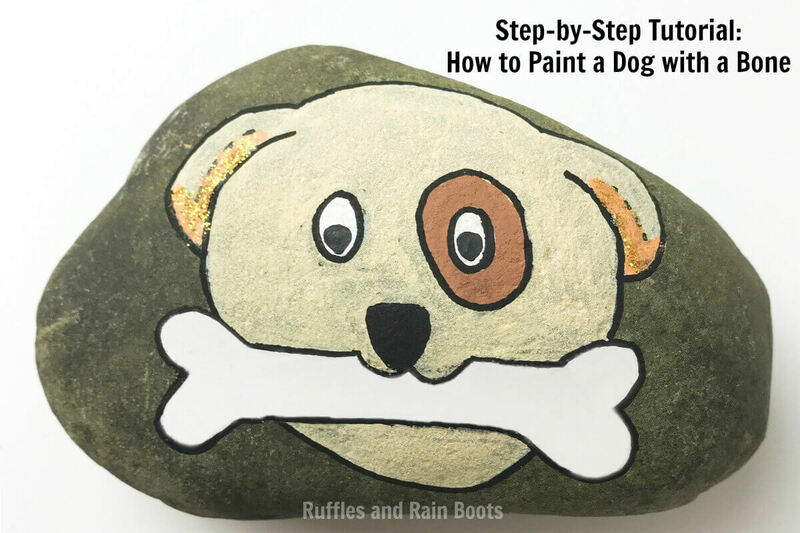 Make this dog rock painting idea in just minutes! 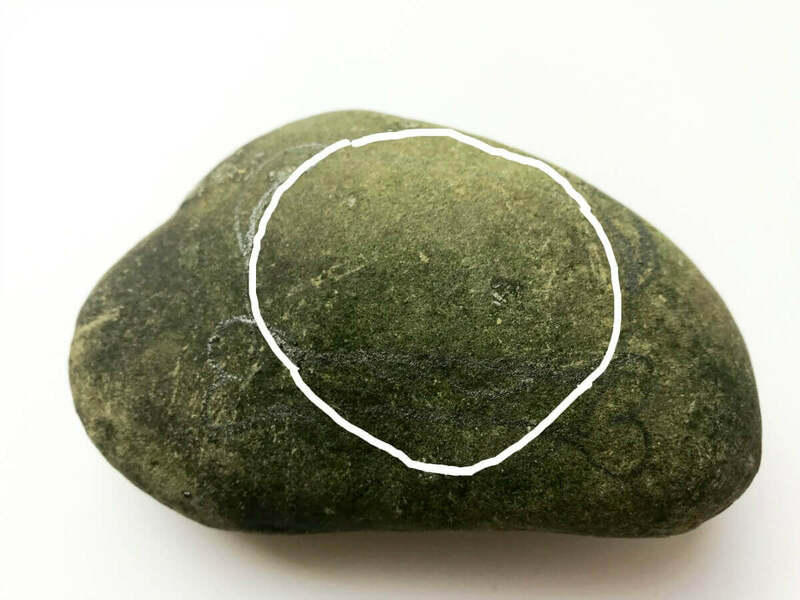 Create a large circle or oval for the dog's head. Add the outline of a bone, extending beyond the circle. Add on a triangle nose just above the bone and ears. Add two small circles for the eyes and a patch, if desired. Fill in the dog's face with the desired color, adding in lips just under the nose and on top of the bone. Fill in the bone with white. Add any color to the ears, color the small eye circles white, and fill in the patch with the desired color. Fill in the eyes with black dots and the nose. Outline the entire dog rock painting. Optional: add glitter accents to the ears or bone. ﻿Cover the paint-pen colored area with a light coat of ModPodge to prevent the paint pens from running. Once dry, add sealant. 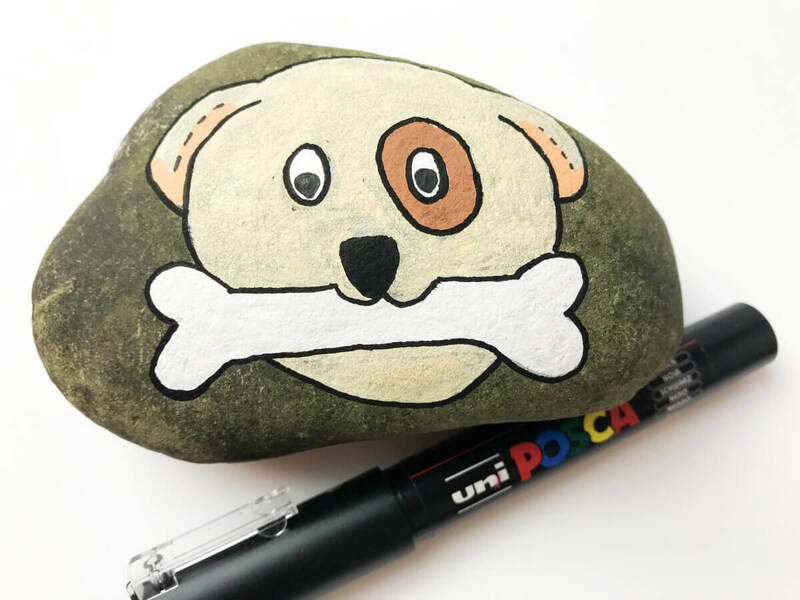 This easy dog rock painting is done in less than 20-minutes, making it perfect for a quick craft for kids. If you have a rock painting idea for dogs, pop over to the Ruffles and Rain Boots page on Facebook and share your rock!